It is a flowering plant that you may well be familiar with, but the obscure common name for Dicentra spectabilis - 'The lady in the Bath' - couldn't be more perfect! Of course, the above image has been inverted to prove the aptness of the 'Lady in the Bath' common name, but in nature the flower hangs downwards on arching flower stems. 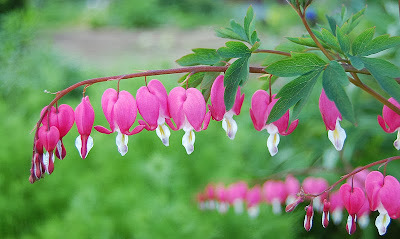 Viewing each flower the correct way up, and not quite so 'blown', they strikingly resemble the conventional heart shape, with a droplet beneath - hence the more popular common name - Bleeding Heart. Native to Siberia, northern China, Korea and Japan, Dicentra spectabilis (now correctly named as Lamprocapnos spectabilis), the 'Lady in the Bath' was introduced into England in the 1840's from Japan by the Scottish botanist and plant hunter Robert Fortune.